Trendy and sporty, these low top trainers from Nike are an essential basic for your shoe collection. 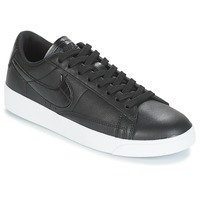 Comfortable and stylish, they have a Leather and synthetic upper and they come in a great black colour. Comfortable and breathable fabric lining offers extra comfort to our feet. Simply essential for your shoe collection.